The College of St. Joseph men’s and women’s basketball teams went an impressive 8-0 combined this past week and are both looking in top form to close out the regular season. The Lady Saints went 5-0 and increased their winning streak to 20 games in a row. They are 22-1 overall on the season and a perfect 12-0 in the YSCC conference. Men’s basketball went 3-0 this week and are riding a five game winning streak. They are 17-7 overall and 11-1 in conference matchups this season. The Lady Saints started things off this week with a victory over Word of Life, finishing the game 102-40. CSJ was led by Jazz Laracuente, who had one of the best games of her college career, scoring a game high 31 points on 12 of 16 shooting from the field. The women’s team was back at it, putting on another dominant performance against Hampshire College. The contest ended 76-26 and Arreonte Anderson was the player of the game, accumulating 26 points, 13 rebounds, 10 steals, and five blocks. The Fighting Saints followed suit with a commanding display of their own, beating Hampshire 102-49. Travis Threewitts was all over the court for CSJ. He ended with 18 points, six rebounds, five assists, and five steals. The Lady Saints took care of business and beat University of Maine at Augusta handily, 76-46. Jazz Laracuente had another terrific performance, which helped lead CSJ to victory, with a game high 28 points, to go along with six boards and four steals. The men’s team played one of their most tightly contested games of the season against the UMA Moose. In a game that saw 13 ties and 12 lead changes, the Saints were eventually able to make a few key plays down the stretch and ended up winning 90-86. 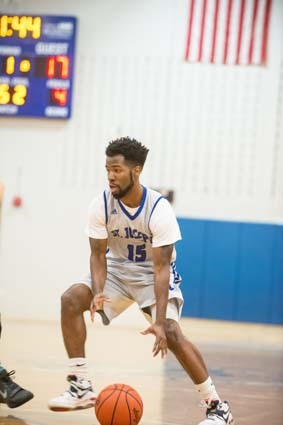 Antonio Gordon led the Saints with 27 points. The Lady Saints finished off the week with yet another blowout victory, beating Villa Maria 87-56. Reigning National Player of the Year Regina Steele put on a masterful performance to help get the win. She had 27 points and 21 rebounds to go along with five blocks. The Fighting Saints won what may have been their biggest game of the season against Villa Maria. It was neck and neck for the duration of the game and came down to Antonio Gordon’s game winning layup, made with six seconds left on the clock, to put the Saints up 75-74. Kareem Brown was a beast all game, accumulating a game high 29 points and 25 rebounds.